Elle - "I love my sister. I love playing games with her. She is beautiful and caring and kind. She is really beautiful looking and i like doing really nice thing with her. I love her little face and her lovely brown hair. She is so beautiful, i want to make a picnic for her. Just a surprise one. Her nice little hands are really cute and i like the colour of her nails. I love going picking buddleia and all different kind of flowers like daisies or buttercups or what ever flowers and i love her name." "Siblings" is a monthly link up where myself and 9 other bloggers all share a photo of their children and then we each send you off to look at another blog. You can then go around in a circle, viewing all of the wonderful photographs and then why not link up yourself if you have two children or more! This month, i am sending you over to Katie at Mummydaddymemakesthree. 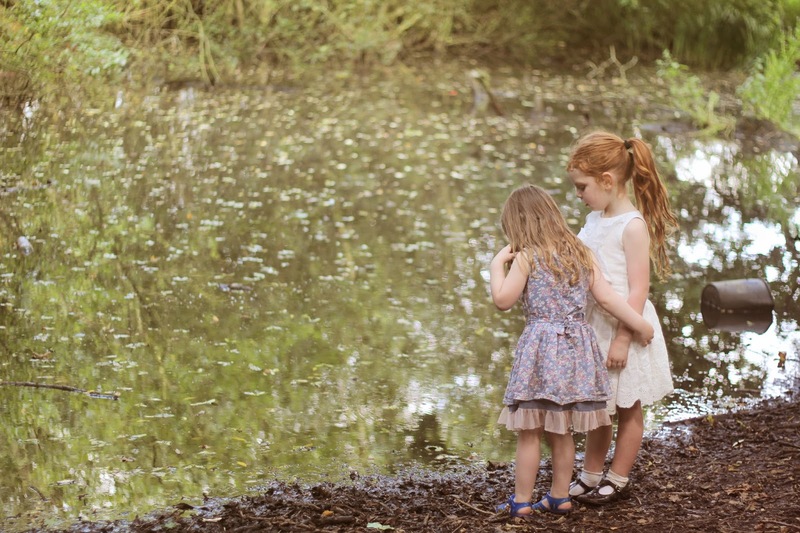 Katie's blog is a firm favourite of mine and she has the most beautiful little ladies. You will just love her blog! Awww... What sweet things to say about her sister! Just lovely! Gosh that photo is like a work of art. Elle's words are so beautiful, she sounds a lovely girl. Such a gorgeous capture and Elle's words about her sister are just so cute. Oh those sentiments are so nice. You are very lucky with your girls. Beautiful photo and what a wonderful thing to say about her sister, very cute! Beautiful photo, and such lovely words too. It sounds like your girls have a very special relationship. Oh it's a gorgeous photo; I love how they're holding onto each other, but it's Elle's words about her sister that really got me; what lovely daughters you do have! Aww that is so sweet! Gorgeous photos and such pretty dresses! I love them. Where is that blue flowery one from? What a beautiful photo and testament of sibling love. Aw so sweet! My three get on really well (most of the time!) too and I love seeing them play together. Gorgeous photo. Beautiful photo and how sweet of your little girl to say such lovely things about her sister. I have a little sister. We used to be the best friends and the worst enemies through our childhood. Now we have an amazing friendship that I would never want to lose. Beautiful girls and such beautiful words too. You must be proud of them both. Awww, that is so sweet what Elle has to say about her sister! !